Scott Mackay (right) netted a hat-trick for Old Leake. Billinghay Athletic displayed some battling qualities despite falling to another heavy defeat, this time away at Old Leake. Three goals in each half sealed Billinghay’s fate and they are still searching for their first points of the campaign. Leake striker Scott Mackay hit a purple patch during the 10 minutes leading up to half-time when he claimed a quickfire hat-trick. Mackay’s first, a far post header, came following good work from Adam Tempest and his second soon arrived when Adam Abell’s shot rebounded to the lurking Mackay. His hat-trick was completed just before the break when Adam Tempest crossed from the bye-line leaving the home striker with the simplest of tasks of toe-poking the ball home. Billinghay managed to pull a goal back within the first couple of minutes of the re-start before Adam Abell finished off a route-one move to make it 4-1. Abell added another soon afterwards before substitute Kane Watson completed the scoring when he followed up his own rebound to make the final score 6-1. Spilsby Town had a comfortable home win when Boston College were the visitors. Liam Papworth hit a hat-trick for Town while Adam Dales also got on the score-sheet in a 4-0 victory. 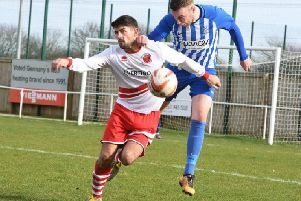 Table-toppers Skegness Town Reserves visited Leverton and found themselves behind inside two minutes when Ben Reeson was chopped down in the box and Nathan Rippin lashed home the penalty, before a poor defensive lapse allowed the visitors to equalise. Reeson then picked the ball up 40 yards from goal and accelerated forward before smashing home from the edge of the box to make the half time score 2-1 to the hosts. The second half was a poor affair with the game never really flowing for either side due to so many breaks in play. The only goal of the second half saw Skegness restore parity when a shot came back off the Leverton bar and was tapped across the line to leave things all square at 2-2. The Skegness goals came from Dan Reid and Damian Howland. Swineshead leapt above Skegness at the top of the table following a 3-1 away win at Coningsby Reserves. An Alex Snaith double and another from Jack Houghton kept the visitors on track. Wyberton Reserves took maximum points in their home match against Pointon Reserves. Jordan Favell, Reece Beauchamp, Danny Woods and Shane Brackenbury hit the vital goals in a 4-2 victory. Pointon replied through Dom Kew and Jonathan Barlow. Freiston and Woodhall Spa United produced an exciting encounter at the Danny Flear Centre. A Tom Bates strike and a John Rutherford penalty looked like being enough to earn Freiston a share of the points with the game entering the final minute, and the scores standing at 2-2. But Woodhall were awarded a penalty of their own and they tucked away the spot-kick, the final piece of action, to make the final score 3-2. Woodhall’s match-winners were Blake Kenneally, who scored twice, and Cameron Robertson. Old Doningtonians produced a storming second half performance to take maximum points in their home encounter against Horncastle Town Reserves. Mark Sharman cancelled out Horncastle’s opener as the first half finished all-square at 1-1 before the home side turned on the power after the break. Curtis Lane put The Dons 2-1 ahead five minutes into the second half and Luke Barnett added number three with a shot from the edge of the box. Brandon Harker sealed victory with a fourth late on. Unbeaten Kirton Town visited Garfits Lane looking to put pressure on leaders Railway, and they rocked their opponents with an early opener inside the first few minutes following a mix-up between keeper and defender, allowing the grateful striker to steal the ball and fire home. Railway responded quickly when a free kick was curled in from the right missing everyone on way through allowing Jake Portas to tap in at the back post. The second half improved somewhat as some real quality play from Railway saw them seal an easy win in the end with Curtis Yeatman completing a second half hat-trick on his return from seven weeks out. There were two great finishes from either side of the box and a powerful strike from the middle of the goal to seal a superb return from injury for the striker. The final goal was a Jake Portas penalty after great work in the middle found Brandon Norman free in the box before he was hacked down by a defender and Portas made no mistake from the spot to seal a fine 5-1 victory for the Railway. Fosdyke finally claimed their first points of the season when they came away from FC Kirton with a resounding 4-1 victory at the Middlecott School. The first half was end-to-end and both teams could have bagged a hat-full, but a combination of good goalkeeping and a heavy pitch kept the score down. It was the home side who took the lead when a deflected cross gifted Mitch Bradley an opportunity and he smashed the ball home with a well taken strike. Minutes before, Fosdyke had gone close when Alex Marulli De Barletta, at the end of a surging run, had fired his shot high and wide. He was not to be denied, however, when a similar opportunity presented itself again after good link up play with Leon Marsh and his cute finish went through the keeper’s leg to square the game at 1-1. Although Kirton went very close on a number of occasions - missing a free header, hitting the post and their striker tumbling when sent through one on one, Fosdyke edged in front before the break when De Barletta, yet again, carved out an opportunity for himself and slotted home with calm assurance. From then on Fosdyke took control and Leon Marsh got himself on the scoresheet, finishing off a fine team move and then nodding in a fourth when Jody Betts headed back across goal from a Ben Parker free kick. A great team performance was almost rounded off in style when player manager Marv Jolly hit a 25 yard pile driver which grazed the crossbar. Friskney entertained title hopefuls Fulbeck United and soon found themselves 2-0 down before Victor Sibert tucked away a penalty to make it 2-1. Fulbeck grabbed a crucial third near the end before Friskney’s troubles worsened when striker Greg Brown somehow collected two yellow cards and was given his marching orders in the dying moments. Fulbeck remain in second place following goals from Chris Bates, Jason Barratt and Dylan Grocock. Park United got off to the usual slow start in their game against table-topping Sibsey and found themselves 1-0 down after just two minutes, but this setback seemed to spur Park into action and they replied with goals from Alex Limb, Ryan Huskisson and a Junior Samra penalty to lead 3-1 at the interval, with a possible upset on the cards. But it wasn’t to be as, in the second half, Sibsey put the Park defence under intense pressure - managing to breach it twice to make the final score 3-3. Kirton Town Reserves claimed a second successive win as they eased their way off the foot of the table when they came out on top of their relegation battle against Swineshead A at Graves Park. Kyle Bates, Jack McMeechan and Matty Tyrell hit the goals as Town stormed into a 3-0 lead before Swineshead pulled a goal back through Cameron Atkinson. East Coast scored three goals at home against Boston International but still finished up empty-handed after they fell to a 5-3 defeat. Nick Lemon, with two goals and another from Scott Dore, were all to no avail as the visitors proved deadly in front of goal. Wrangle suffered a heavy defeat at home at the hands of FC Hammers, who moved up to second place following their thumping 9-1 away win. Dan Redford did grab Wrangle’s consolation goal from the penalty spot before he was forced to leave the action with an injury. Boston Titans’ Mike McPhail is trying single-handed to pull his side out of the doldrums following another heavy defeat. The Titans managed to put together just 10 players for the start of their home match against leaders Wyberton A and, unsurprisingly, conceded double figures. For the record Wyberton’s goals came from Michael Reeson (three), Louis Gosling (three), Kurt Smyth (two), James Stubbs (two) and Ellis Wakefield (two). To make matters worse for Boston Titans, five players then turned up during the match to witness the thrashing. Northgate Olympic enjoyed their away outing at Spalding Harriers when they returned home with a superb 5-0 away win under their belts. Rob Spencer hit a hat-trick while Conor Yarwood and Dan Broughton also got on the scoresheet. The only shock of the quarter-finals took place at Pointon Reserves where Division Three side Benington Reserves snatched a great 2-1 away win against their second division opponents, although it required extra time. Rowan Evans and George Dix hit the matchwinning goals for Benington while James Key grabbed The Pointon goal. In a heated contest at Fishtoft their reserves made it through to the last four with a 4-2 win against Leverton Reserves. Fishtoft were 1-0 up early on through a goal from Jack Cridland, but it didn’t take long for Leverton to get back into the game and they equalised through Diogo Egas, who finished off a superb pass from Sam Bird. Leverton then went in front when Joe Wood was hauled down in the box and the same player dusted himself down before sending the keeper the wrong way. Fishtoft dragged themselves back into the tie just before half time when Ian Mitchell rounded the keeper and stroked the ball into an empty net to level at 2-2. Fishtoft started the second half more impressively and they had numerous chances to put themselves ahead, but they failed to take their chances. They did eventually edge back in front to make it 3-2 after a good passage of play and, as the ball landed to Jack Cridland, he tucked the ball away for his second of the game before he missed a golden chance to complete his hat-trick, drilling a penalty wide. None of which mattered, however, as a superb free-kick from Connor Massam was met by the head of Lee Bradley to make the final score 4-2. Swineshead Reserves made sure there was no upset with a 3-0 home win against Spilsby Town Reserves. Josh Ullyatt-Sands, Josh Smith and Callum Karpyszyn grabbed the crucial goals. Unfortunately for Fosdyke Reserves they were unable to fulfil their quarter-final tie due a shortage of players, leaving Coningsby Reserves with an easy passage into the semis.